In a phase 2b study, ALG-1001 showed additional efficacy in patients who had plateaued on chronic anti-VEGF therapy. In a previous article published in Retina Today earlier this year, I provided some background on ALG-1001 (Luminate, Allegro Ophthalmics), including its mechanism of action and clinical experience.1 Specifically, I summarized the top line data from stage 1 of the controlled, double-masked, dose-ranging DEL MAR phase 2b clinical trial evaluating ALG-1001 in patients with diabetic macular edema (DME). In this follow-up article, I offer an overview of the top line data from stage 2 of the same study. 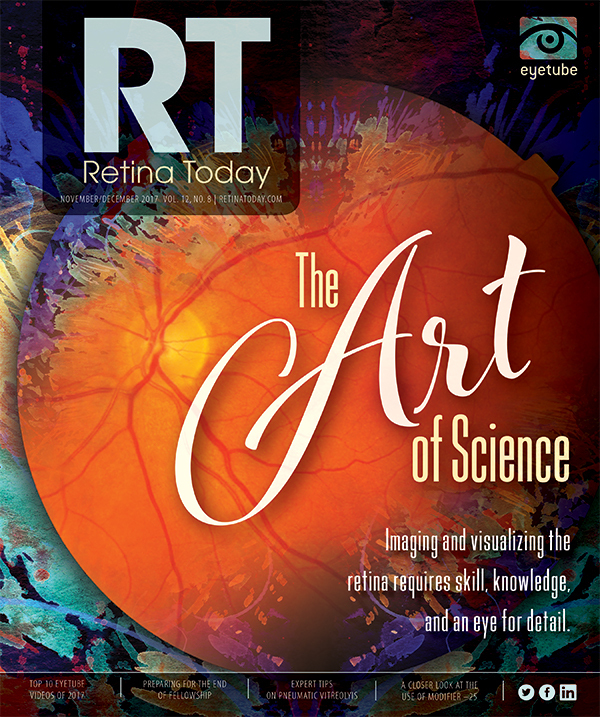 ALG-1001 is a first-in-class integrin inhibitor that acts to simultaneously deactivate multiple ischemic pathways responsible for the development of DME and other retinal vascular diseases.2,3 Research with ALG-1001 at Johns Hopkins University and the California Institute of Technology has provided important insights about the mechanism of action of integrin inhibitors.4 For example, gene expression analysis of retinopathy of prematurity mice showed that ALG-1001 specifically targets integrins that are upregulated in response to oxidative stress but that the agent has minimal effect on unstressed retinas. By targeting the integrins associated with oxidative stress, ALG-1001 was able to downregulate angiogenic and inflammatory processes that occur downstream of the oxidative stress. • ALG-1001 has been studied in two US phase 2 trials involving a total of 218 patients, with demonstrated safety and efficacy across all doses up to 3 mg.
• In stage 1 of the phase 2b DEL MAR study, when used as monotherapy, ALG-1001 performed similarly to anti-VEGF therapy with half the number of injections. • Stage 2 of the trial provided the first clinical evidence of the rationale for sequential therapy, in which an anti-VEGF agent is used first, followed by the multifaceted mechanism of action of ALG-1001. Other studies with fluorescent tagging of the integrin inhibitor showed that it binds to the retinal pigment epithelium for several months after injection into the mouse retina. There, it turns off excess production of a number of growth factors, including VEGF. This research helps to explain how anti-VEGF and anti-integrin therapy might be complementary for the management of retinal vascular disease. Consider the analogy of a kitchen sink, in which the water flowing into the sink consists of growth factors (eg, VEGF, pigment-derived growth factor, and basic fibroblast growth factor). In a normal eye, the tap is turned on slowly, and the relatively low introduction of these growth factors allows them plenty of time to drain out of the sink, maintaining homeostasis. Under pathologic conditions, such as when patients develop DME, growth factor production is dramatically increased under oxidative stress, and the sink starts to fill up. Anti-VEGF drugs help the sink drain faster and may still be able to keep everything in balance; otherwise, the drain becomes overwhelmed. Integrin inhibition has a somewhat slower effect on the accumulated VEGF blocking the drain, but it can actually turn off the faucet producing the excess growth factors, leading to better long-term drainage of the sink. There is a clear theoretical rationale for sequential therapy, in which an anti-VEGF agent is used first to drain the sink, followed by the multifaceted mechanism of action of ALG-1001 to turn off the faucet to prevent growth factor accumulation for a relatively long duration. Stage 2 of the phase 2b DEL MAR trial provided the first clinical evidence of this complementary mechanism of action. Stage 1 of the phase 2b DEL MAR study included 136 patients with DME enrolled across 32 US sites.4,5 The primary endpoint was noninferiority to bevacizumab (Avastin, Genentech), defined as a difference of 3 letters or less in mean best corrected visual acuity (BCVA) at 20 weeks. In three ALG-1001 arms, patients were treated with three monthly loading injections of 1, 2, or 3 mg of the drug, followed by 12 weeks off treatment. There was also an anti-VEGF agent arm, in which patients received 1.25 mg of bevacizumab in six monthly injections. In all arms the drugs were given as monotherapy. In stage 2 of the trial, ALG-1001 was evaluated as a sequential therapy (given sequentially following a single bevacizumab pretreatment) or in combination with bevacizumab in 80 patients with DME.6 Bevacizumab was also given as monotherapy in a control arm. Patients who received one treatment of 1.25 mg bevacizumab (at week 0) followed by three 1-mg injections of ALG-1001 (at weeks 1, 4, and 8) and 12 weeks without any treatment had BCVA gains equivalent to those seen with bevacizumab given every 4 weeks as monotherapy (six injections total) at all time points. The mean gain in BCVA was 7.1 letters for patients assigned to receive ALG-1001 with bevacizumab pretreatment compared with 6.7 letters for patients assigned to the monthly bevacizumab control group, meeting the primary endpoint of the study. It is notable that these gains were achieved even after 12 weeks off any treatment in the ALG-1001 arm. The combination arms did not meet the primary endpoint. We know that approximately half of patients with DME do not return to functional vision with standard therapy but instead seem to plateau in their response to anti-VEGF agents.7 Finding an approach to help these patients is highly desirable, and stage 2 of the DEL MAR study provided some encouragement that sequential therapy might hold an answer to that challenge. About 60% of the patients treated in the DEL MAR trial had been on chronic anti-VEGF therapy before entering the study. In a subgroup analysis, these patients had the most robust improvements in BCVA, both at the primary endpoint of 20 weeks and at the point of maximum BCVA effect, whenever that occurred (Figure). Among those previously treated with anti-VEGF therapy, those in the sequential therapy group had an increase of 8.4 letters of BCVA at 20 weeks, compared with 5.8 letters for those in the control group. This suggests that ALG-1001, with its unique mechanism of action, may be an important element in treating the large population of DME patients whose response is inadequate or has plateaued. Figure. Patients who had been on chronic anti-VEGF therapy before being enrolled in the DEL MAR study had the most robust improvements in BCVA during the study. Phase 3 clinical trials with ALG-1001 lie ahead, and there is much more we can learn about integrin inhibition. We are now seeing the potential for new treatment paradigms that could take advantage of both bevacizumab and ALG-1001, with anti-VEGF pretreatment to help clear accumulated VEGF (the standing water in the sink), followed by ALG-1001 to decrease VEGF production and stabilize the retinal response to diabetes (turning off the faucet). The hope is that this dual approach could offer sustainable and persistent long-term improvements in visual acuity outcomes, especially for patients who are not responding adequately to current therapy. 1. Kaiser PK. Anti-integrin therapy in treatment of DME. Retina Today. 2017;12(5):57-59. 2. Friedlander M, Theesfeld CL, Sugita M, et al. Involvement of integrins anti-alpha v beta 3 and anti-alpha v beta 5 in ocular neovascular diseases. Proc Natl Acad Sci U S A. 1996;93(18):9764-9769. 3. Ramakrishnan V, Bhaskar V, Law DA. Preclinical evaluation of an anti-alpha 5 beta 1 integrin antibody as a novel anti-angiogenic agent. J Exp Ther Oncol. 2006;5(4):273-286. 4. Kaiser PK. Topline results from prospective, double-masked, placebo controlled phase 2b clinical study evaluating Luminate in patients with diabetic macular edema. Paper presented at: The Association for Research in Vision and Ophthalmology Annual Meeting; May 7-11, 2017; Washington, DC. 5. Boyer DS. Human phase 2 clinical studies update. DEL MAR Phase 2B. Paper presented at: Angiogenesis, Exudation, and Degeneration Annual Meeting; February 11, 2017; Miami, FL. 6. Boyer D. Topline results from prospective, double-masked phase 2b clinical trial evaluating ALG-1001 (Luminate) compared to bevacizumab in patients with DME. Paper presented at: The American Society of Retina Specialists Annual Meeting; August 11-15, 2017; Boston, MA. 7. Comparison of Age-related Macular Degeneration Treatments Trials (CATT) Research Group; Maguire MG, Martin DF, Ying GS, et al. Five-year outcomes with anti-vascular endothelial growth factor treatment of neovascular age-related macular degeneration: The Comparison of Age-Related Macular Degeneration Treatments Trials. Ophthalmology. 2016;123(8):1751-1761.